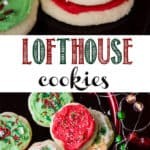 The original Lofthouse Cookie was created from a family recipe that had been passed down from one generation to the next. 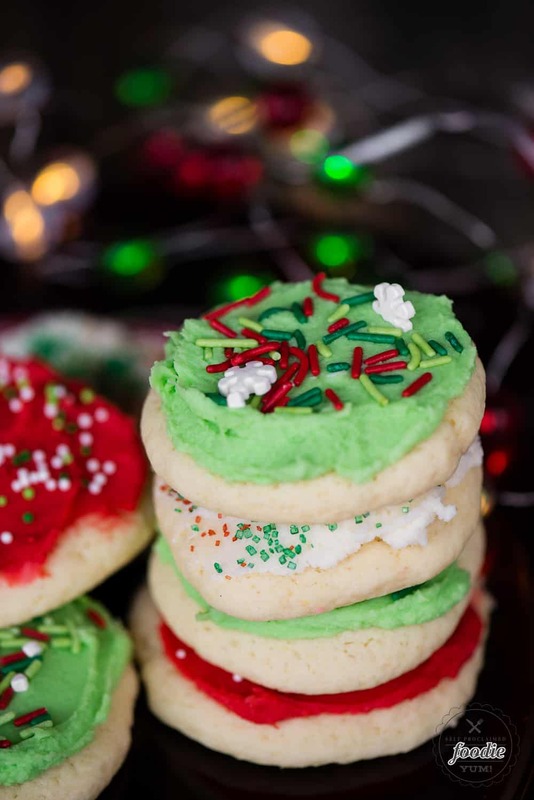 I think the homemade version of the Lofthouse cookie recipe I share here is amazing. 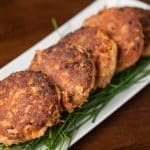 Homemade is always best! Like most homemade cookies, they taste best in the first day or two. 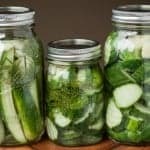 If you want to make them last longer than that, wrap them in an airtight container. First step is to make the cookies. This is one of those cookie recipes where you can make the dough and bake it right away. No refrigerating. No rolling. No cutting. 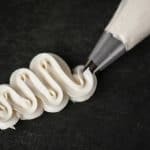 The frosting is a traditional butter frosting made with powdered sugar, extracts for flavoring, and some milk to thin it to your desired thickness. Preheat oven to 400°. Line a baking sheet with a silpat or parchment paper. Set aside. 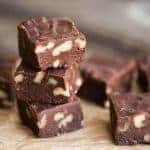 In a stand mixer fitted with the paddle attachment, or in a large mixing bowl using a hand mixer, cream together the butter and sugar until smooth and light in color. Add in the sour cream, eggs, vanilla extract, and additional flavored extract, if using. Mix until just combined. In a separate mixing bowl, sift together the flour, baking powder, baking soda, and salt. Add the dry ingredients to the wet in three additions—mixing well after each. Roll dough into 2″ balls and place 2″ apart on the prepared cookie sheet. 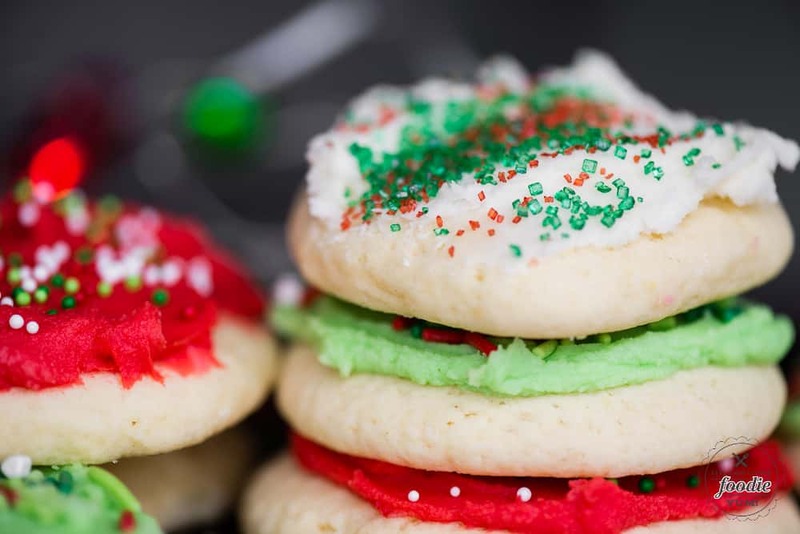 Use a roller (a mini roller works great) to roll cookies flat (about 1/4 to 1/2 inch thick). Bake cookies in preheated oven 7 minutes. They will not be brown when done. Remove from oven and transfer from cookie sheet to cooling rack. 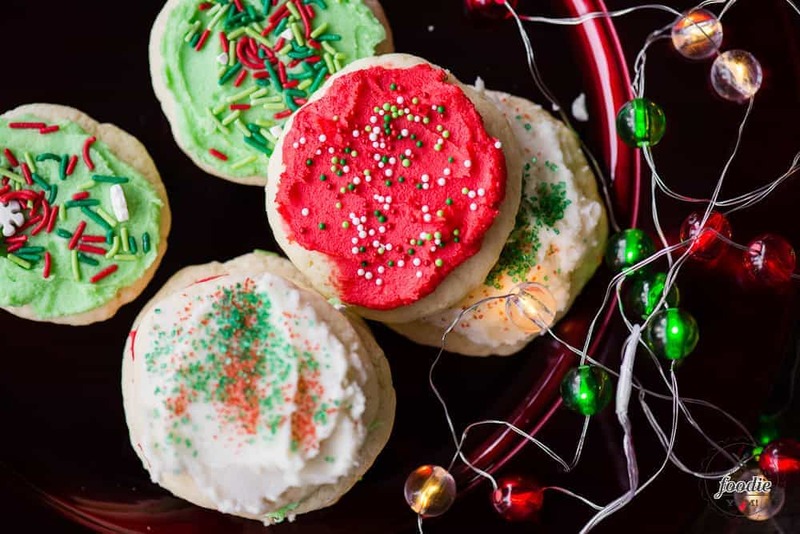 Allow cookies to fully cool before frosting. In a stand mixer fitted with the paddle or in a large mixing bowl using a hand mixer, cream together the butter, vanilla, and extract (if using) until smooth. Add in the powdered sugar, 1 cup at a time, mixing until smooth after each addition. Add in the milk and food color, and beat until fluffy and smooth. 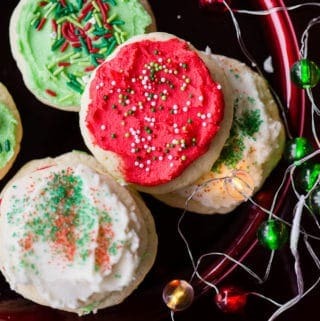 Spread onto cooled cookies and immediately sprinkle on sprinkles. Store cookies in airtight container. They also freeze well if you'd like to make ahead. I always heard of these as big soft cookies. But Lofthouse is a much more intriguing name! I have added these to my mental list of things to bake before the end of the year.